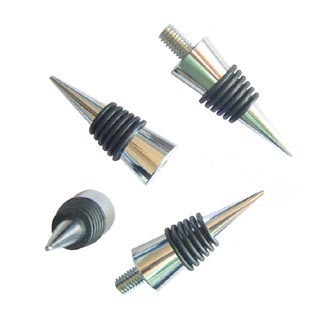 Turn your own unique Tops for these solid chrome stoppers and quickly create a great gift that all wine lovers will appreciate. Silicon rubber multi rings seal the bottle, and unlike traditional cork stoppers, the metal stoppers will not transfer taste and smell to other bottles. Simply drill a 8.5mmmm hole in your wood blank, screw the blank onto the mandrel easily made by turning a wooden spigot and gluing in a thread from one of the stoppers. I have managed to source stoppers at a better rate so have passed on the saving. With the ever increasing new boutique wineries springing up everywhere these are easy to sell as they look great on the retail counter as an impulse buy. Click the button below to add the Bottle Stoppers Multi Ring Chrome Stopper to your wish list.